In soap making, various machines are essential in the production of laundry soaps or toilet soaps. 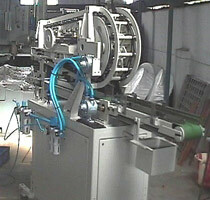 One of the most important machines used in the soap making industry is the soap cutting machine. Soap cutting machines are used in cutting soap bars into different sizes and lengths. Correspondingly, these machines are also used in cutting soap into different forms and shapes as well. The soap cutting machines consist of soap cutters which are usually placed downstream from a plodding machine. The soap that comes out of the plodding machine is then directed into the cutter for the cutting operation. There are many types of soap cutting machines. Some of these types include the air powered soap cutter, manual soap cutter, loaf soap cutter, double cutting machine, bar-size cutting machine, and rotary soap cutting machine. The air powered soap cutter is practical for cold processed soap cutting. A typical air powered soap cutter produces thousands of perfect bars in one day. This machine is also ideal for batch processing. The manual soap cutters on the other hand, are ideal for cutting large blocks of soaps manually. While these machines are available in standard sizes and models, these cutters can be custom designed for particular needs and specifications. Loaf soap cutters are used in cutting soap loaves into bars. These cutters perform the cutting operation quickly and easily because of its’ built in cutters. The double cutting machines are actually hand operated machines that are used in cutting slabs into bars, and bars into cakes. These machines are fitted with cutting frames that are detachable for ease and convenience. The bar-size cutting machines are used in cutting soap slabs into bars and into cakes. These machines cut the soap into the desired shape and dimension. Moreover, for simple and versatile operation, these machines are equipped with detachable cutting frames. Finally, the rotary cutting machines are the most ideal cutters used in cutting bar soaps at fixed lengths. These machines are actually driven by the forced travel of the extruded soap bar from the plodder. Rotary soap cutting machines are equipped with two stainless steel guide rings that are mounted with cutting knives suitable for cutting the soap bar into the desired lengths.